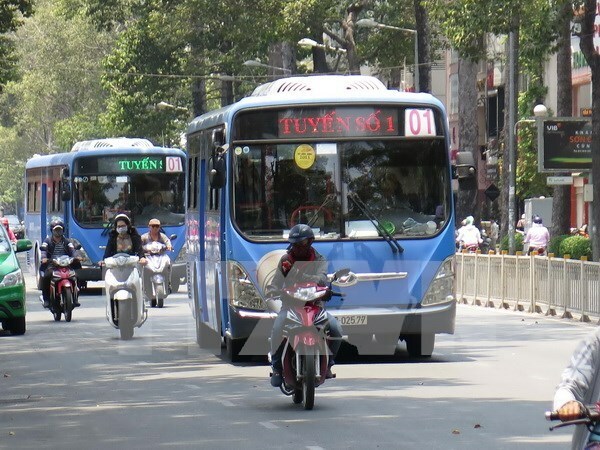 HCM City (VNA) – Ho Chi Minh City plans to increase the number of compressed natural gas (CNG) – powered buses with a view of running 841 CNG buses on 39 routes by the end of this year. The municipal People’s Committee has requested Vietnam Oil and Gas Group (PVN) and PetroVietnam Southern Gas Joint Stock Company (PV Gas South) to speed up the construction of nine new CNG stations and expansion of the four existing stations. PVN was asked to keep the CNG price at 60 percent of the diesel oil price for the city’s bus operation. The city also suggested PVN plan a CNG supply system for public transit to reduce environmental pollution and spur development of the public transit sector. Ho Chi Minh City currently has 256 CNG buses running on some of the fare-subsidised routes. The vehicles are fueled at four stations provided by PV Gas South, namely Pho Quang Bus Station, National University Bus Station, An Suong Bus Station and Tan Kien Station.